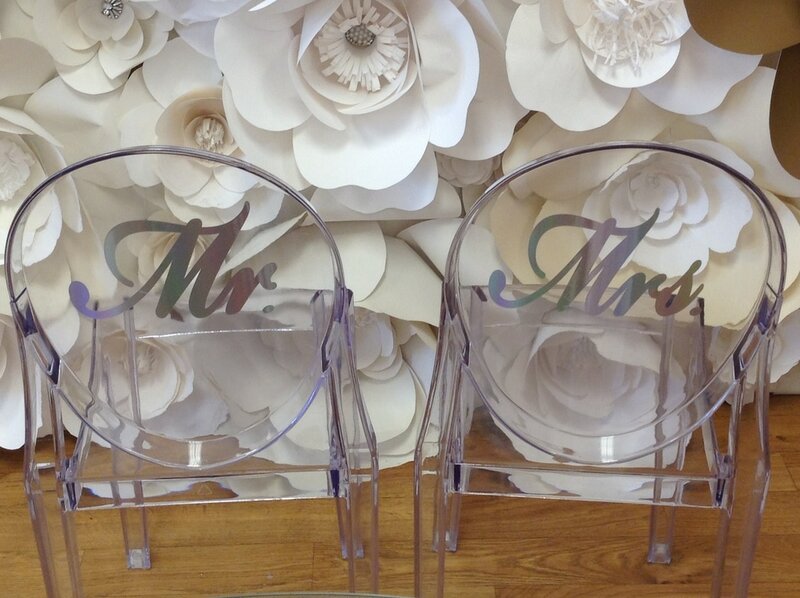 To add that personal touch to your event a chair decal will be a great way. We have Monogram Letters Decals and Frames with Monogram Fonts Decals. The decals are made of a high quality removable decal material. They will remove easily after your event. The approx. sizes of the frames are 8” wide by 9” high. This size will fit most standard ghost chair backs. We can also cut out your logo if you have on. Please contact us for information. This listing for the vinyl decal ONLY. 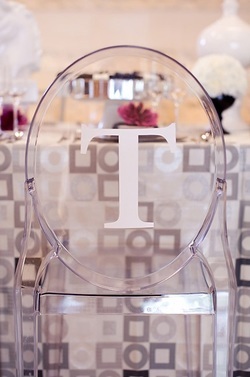 Single, Two or Three letter monogram vinyl decal for ghost chairs. Use this removable decal on ghost chairs, mirrors or walls and other event props. Can be done in several color choices. Decal shown on clear ghost chair. Decals are removable and re-position able but not reusable. Also includes transfer tape for easier application. Decals are approximately 8-9 inches depending on letters. We have over 200 colors for you to choices from. THIS LISTING IS NOT FOR THE CHAIRS, THIS LISTING IS FOR THE VINYL DECAL THAT STICKS ON THE BACK OF THE CHAIR. To purchase select quantity and color and add to cart. During checkout please be sure to include the initial(s) in the notes box and specify need by date to ensure timely shipping otherwise Orders ship within 5 to 10 business days.